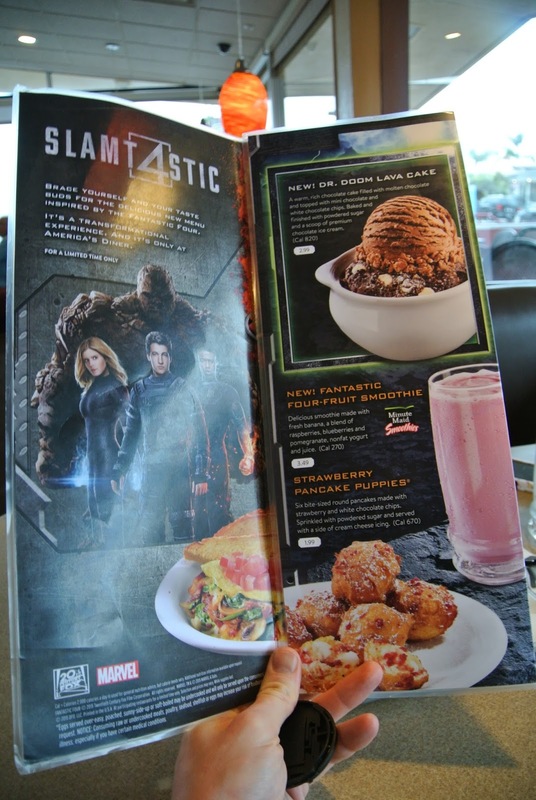 Slamtastic 4 Menu at Denny's - San Diego Dining Dish! Hold onto your asteroids! 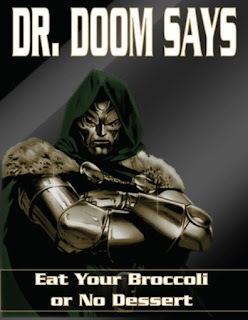 We're gonna need a Galactus-sized appetite to take on these meals! I was so disappointed this past winter that Denny's didn't do a special menu for the final Hobbit movie. And now they did us a favor by creating a special menu for the least-anticipated superhero franchise of the summer. With the movie opening this Friday, and it's already getting seeming glum. The previous films are not regarded as good by any means, but this one is being touted as a more unwanted remake than the Spider-Man reboots. Cooked in cosmic radiation (or just stale french fry grease -- you decide!) are four mouth-watering plates of fried items with carbs and egg product. If you are not familiar with the main characters -- get out of here! -- just kidding, they are Mr. Fantastic, the leader of this raggle taggle bunch; his girlfriend/wife, Invisible Woman; her brother, The Human Torch; The Thing; and the villain, Dr. Doom (not an MD). The Thing Burger. Good Zeus above, the monstrosity of Frankenfood! A huge burger patty piled with an egg, bacon, hash browns and thousand island dressing (Thing sauce), served on a cheddar bun, and fries. The Fantastic Four Cheese omelet - which is just what it sounds like - a cheesy, gooey plate of egg product with whatever vegetables didn't make it into the salad. And for Mr. Fantastic, there was....nothing! Like, seriously? The leader of the band, and he gets diddly? The injustice! That being said, I'll crack a joke about our stomachs stretching just like Mr. Fantastic! 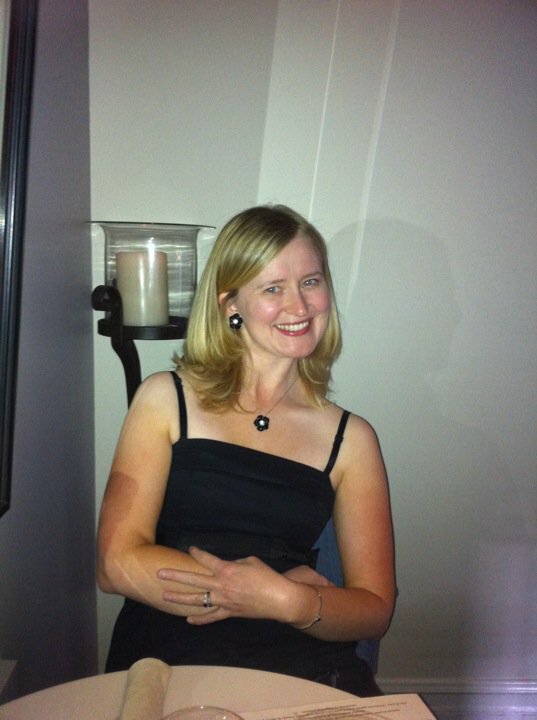 And really, shouldn't Invisible Woman's stuff be something at least clear? You know, 'cause of the invisible thing? So...yeah, we did it. We ordered the Thing Burger. And that was a mistake that would rear its head sooner than we thought. It tasted about how you would expect a frozen beef patty with frozen hash browns, eggs, bacon, and cheese. This burger actually made me long for the days of the Hobbit Hole breakfast with its perfectly normal levels of culinary debauchery. 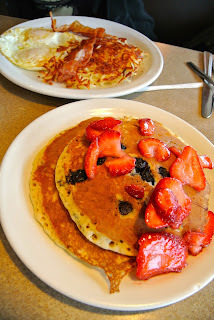 I caved and ordered the Invisible Woman Slam, since it's girl food (you know, fruit) and pancakes. There was a corn syrup glaze for the fruit, which I declined. To be diet-y girl food, there certainly was a lot. Invisible Woman must work out a lot to eat these regularly! There were two desserts as part of the menu -- a Dr. Doom Lava Cake, a chocolate souffle cake with chocolate ice cream, and Red Pancake Puppies, which they were too lazy to tie in to the movie. Like, do people seriously eat these? We ordered them once from the Hobbit menu, and barely tasted them, they were so awful. Are they just contractually bound to feature these disgusting things as part of the tie-in menus? We had so much food with the "entree" part that there was no room for dessert, and neither of them were particularly exciting. I think that this final pic sums it up. And who can argue with Dr. Doom?